Don’t be afraid of technology. For some of you, it may seem odd to track your dog using a smart collar/pet tracker, but when you think about it, it makes a lot of sense. Our dogs can be great at letting us know what they need sometimes, but not always. While we like to think that we can communicate with them perfectly, there are things they can’t tell us because they can’t measure them. Is a dog going to be able to tell you how much exercise they get on an average day, compared to how much they need? Are they going to be able to tell you if they manage to sneak out and get into trouble away from home? Now, you’ll see advertising messages like “Whistle 3 is for smarter dog owners”, and we want to address that quickly. You don’t have to be some kind of intellectual powerhouse to get a collar for your dog, but if we accept that knowing more things can make a person smarter, then all of the data you gain from the Whistle can certainly make you smarter in the context of knowing what’s up with your dog. We’re going to be focusing on the Whistle 3 in particular, but we’ll also be comparing it to two other very popular smart collars for dogs, the Link AKC and the Tractive. Each of these 3 will have their own in-depth review just like this one, but we’ll also mention them a bit here and there to help you compare them side-by-side. It’s one size fits all, and is meant for any dogs that are larger than 8 pounds. It can help you pinpoint your dog’s exact location if they ever run off. It lets you precisely monitor your dog’s daily movement and physical activity, to make sure they’re getting enough exercise, and to help you track how exercise impacts their mood, health, and overall quality of life. The Whistle allows you to communicate with your dog’s needs in ways that weren’t possible before. It requires a subscription to cell service, which starts as low as $7 per month. That’s quite a bit less than our human phone bills, and a small price to pay for the better coverage of being able to track your pet all across America. You can allow family members and even friends to tap into your pet’s Whistle, so they can use their own smartphones to see what your pup is up to, to keep an eye on them for you, or just for fun. Whistle also uses WiFi and GPS technology to round-out it’s tracking abilities, but the cellular service is a requirement nonetheless. The Whistle attaches to your pet’s collar, it’s a small device that should fit most regular collars. Here are some of the key features that really stand-out, and the most important ones to know about. Cellular Connectivity: The Whistle uses America’s largest cell network (AT&T) to keep tabs on your pup, even if you’re nowhere near WiFi. This is useful, since when a dog gets away, sometimes they’ll manage to wind up pretty far from home, but as long as there’s cell service, their collar will be able to communicate with the towers to pinpoint their location. Your phone itself doesn’t need to have cellular service, however the tracker does require cell service to work. The only downside to this is if you’re in a remote area and really roughing it somewhere without service, and your dog goes missing, the collar won’t be able to help unless they’re getting some level of signal. Battery Life: The length of the battery life in the Whistle 3 can vary based on a number of factors, including how active your dog is and which features are being used the most. When your dog is at home or within range of WiFi, the device uses less battery power, so the less often it has to switch over to cellular, the more juice you’ll preserve. It only takes about 2 hours to fully charge the collar, and it’s a good idea not to let it get too low, because if your dog runs away while the battery is low, you’ll have less time to track them down. Durability: This little device is STRONG! It’s totally waterproof up to 1 meter deep for up to 30 minutes. If it’s underwater for longer than that, something is seriously wrong! You don’t have to worry about your dog running through puddles or playing in the rain, your Whistle 3 will be absolutely fine. They do, however, recommend you wipe it off before charging it if it gets wet or dirty. Legacy Support: Upon the launch of the Whistle 3, they ensured that everything continues to work just fine for past versions. We’ve seen some other “smart” tech in the past where you have to replace your device, but with the Whistle, the only reason you would need to upgrade from a previous version is if you’re interested in some of the new features. 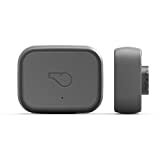 90 Day Trial: Since these trackers are a two-pronged package, where you have to buy the device itself, but also a subscription service, in the long-run these companies are making their money on the memberships, rather than on the hardware itself. In fact, it’s entirely possible they’re not making much at all on the hardware. As such, they offer you a 90 day trial where you can see if you even like using the Whistle with your dog or not. If you don’t like it, you get your money back. If you do like it, you’ll obviously continue to pay them the money fee for a long time, so it’s worth it in their books to give everyone a chance to try out the Whistle. It’s nice to see companies that believe in their products enough to put their own cash on the line. Discounts for Upgrades: We’ve already talked about their support for legacy models of the Whistle, but to take that a step further, you can reach out to their support team if you have an older version and you want to upgrade. They don’t specify exactly what type of a discount or offer they’ll have for you, but they do encourage existing customers to reach out if they’re ready to get the latest model. On top of that, they’ll prorate any membership you’ve paid for your current version when you transfer over to the Whistle 3. Sleep Patterns: Not only does the Whistle 3 give you a look into your dog’s activity when they’re awake, but it actually helps measure the quality and restfulness of their sleep, too. We keep hearing more and more about how important sleep is for humans in regards to our overall health, so it’s nice to see dogs getting some attention, too. Here are some of the notable differences between the Whistle 3 smart dog tracker and the Link smart collar. With the Whistle, you can use any collar you want. With the Link, you need to keep the device inside of the provided collar, it’s not meant to be used with any collar. On the plus side, Link will send you new collars if your dog needs a different size when they get bigger, and you can just pop the device into them – but that’s not even necessary with the Whistle 3, since it fits the collar your dog already wears. If you’ve seen some other Link vs. Whistle 3 reviews, some of them seem pretty over the top and they seem to exaggerate the pros of one option, while downplaying the other ones. Frankly, they’re both great units. Compare the price, choose the one that suits you and your dog best, and you can’t go wrong with either one. The Whistle 3 might edge it out just a bit, due to some minor design choices, since they’ve been through several iterations already which provides ample opportunity to learn from previous versions and to improve. If you look at the overall reception, it also leans slightly in favor of the Whistle 3, for what it’s worth. Whistle’s take on this is that chips are good, but they’re reactive instead of proactive. They require your dog to be found before your pet can be returned to you, but with a Whistle, you’re able to actually find your dog and that’s the big difference. It’s a good idea to have both, then you’ll have the peace of mind in knowing your dog has the highest possible chance of returning home if they do end up astray. Should You Get a Whistle 3 Pet GPS Tracker? Compared to the other popular smart pet trackers, the Whistle 3 can compete with the best of them. It has the standard feature set you would expect, and some nice little bonuses, too. While the most popular and best pet trackers are all fairly equal, it comes down to the smaller nuanced details. If you want something that has a built-in collar, the Link fits the bill. If you would prefer that your pet continues to use their own collar, then the Whistle gets the nod, hands down. If you want to be able to track your dog’s movements (including when you take them for walks), to quickly get alerted if they ever run away and be able to find them, to monitor their activity and other health markers, and just to take your dog into the digital world in a way that we haven’t seen before – the Whistle 3 can get you there. If you’re the type of person who wears a fitness tracker and likes to keep track of your own vital health information, then you’ll LOVE having a Whistle 3 for your four legged friend. Your doggo will also love all of the extra attention they’ll be getting from you, as you’ll be more engaged in their day-to-day well being. As pet owners, we sometimes focus on the bigger health milestones like when our dogs are sick, or when we have a vet visit, but we don’t always give enough attention to the health of dogs on a day to day basis. Tractive GPS Pet Tracker​: Read This Before Buying a Smart Collar!